I fell in love with Iceland last winter and vowed to go back see more of the Country including the more remote Northern Region. This winter I was blessed with great weather (unusual since its typically raining or snowing 60% of the days during the cold season). The map below shows my journey around the island, starting with the Snaefellsjokull Peninsula and ending in Vik (after circumnavigating clockwise). Snaefellsjokull offers some of the country’s most impressive coastal views. Shown below is the Katklettur Arch (which is accessed by a hike over the safety fence down an 80 ft cliff). Had the op to do this pre-dawn to capture that sun star! About 15 mins from the Arch (near Djupalonssandur) lies a remote stretch of Basalt lined beach (a bit of hiking to access) looking back on Snaefellsjokull Mountain. By the way, the mountain is famously immortalized as the access point to the Earth’s center in Jules Verne’s novel Journey to the Center of the Earth. Winding our way up north I totally hit the jackpot. Not only do I get to check out the Hvitserkur Sea Stack, but view it back lit by some badass dancing Northern Lights. Did I mention the hike down the icy cliff to the beach (wearing micro-spikes) & a headlamp in the dark? Back on the road heading due East we hit the Lake Myvatn region, home to perhaps my favorite waterfall on Earth, Godafoss. Its crazy blue color comes from water born minerals and the surrounding snow that reflects and accentuate the color. PS. In Iceland if it ends “foss” it’s a waterfall. On route to the waterfall there are some great lakes/ponds to explore. I’ve worked my way to Iceland’s East Coast. Driving towards Djupivogur at day’s end a clearing storm is looking pretty impressive. Jump out and run approx. 3/8 mile towards the shore line. The coast is littered with spots like this. Talk about a target rich environs. Vestrahorn lies about one-hour South. The mountain is framed by some treacherous rocks in the foreground. Easy to get grabbed and taken for a wash (along with your equipment) by the occasional rogue wave that washes up. The following several days are spent in Jokulsarlon. 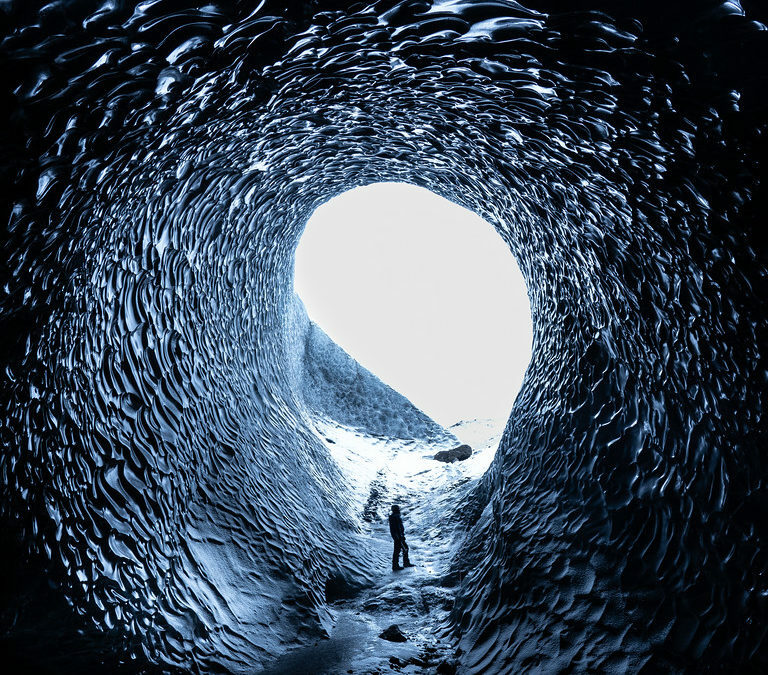 The area hosts the well known and often visit Ice Lagoon as well as some amazing ice cave (which require jeeps with giant 42 inch tires to access. 40-minute climb onto a glacier). Excited to see more! I’ve just scratched the surface here. Click here to see more images!